A micro-platform for high resolution device processing and connectivity. Not all devices and IoT applications are suitable for interacting with a cloud based IoT platform. Some devices generate information at frequencies ten (10) to a thousand (1000) times a second while still other devices can generate data at 100 or more times that rate. The practicality of sending data from a device at any of these frequencies over the internet is questionable at best. While the overall amount of information sent will be relatively small, a latency on the level of tens or hundreds of milliseconds when sending this data means the processing of this information in the cloud will quickly fall so far behind the data transmission to make the processing, and any action taken as a result of this processing, meaningless. The Felix Edge Micro-platform is provided to specifically address the need to support high-resolution devices in an IoT solution. The Felix Edge Micro-platform runs at the edge, on the same local network as the high-resolution devices, and provides all the services necessary to properly support and integrate these devices into a comprehensive IoT solution. 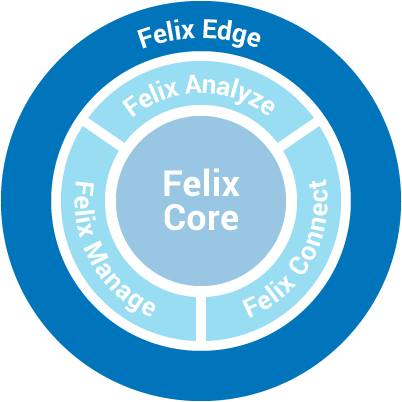 A version of our Felix Connect service modified specifically to run at the edge and support connections from high-resolution devices. A fully capable instance of the Felix Analyze service running at the edge. Designed to easily integrate local services with Felix Edge so that current business processes and services can take advantage of information generated by Felix Edge. The link between the edge and Felix cloud services allowing out-of-band communication with Felix cloud and ensuring processing of high-resolution data is not impacted. Felix Edge allows the Felix IoT platform to support high-resolution devices capable of sending updates as frequently as thousands of times per second. Felix Edge supports integration with local services so that information generated by the micro-platform can be used in existing business processes without the added latency of internet transmission. The Felix Edge micro-platform can be managed using the same Felix cloud services that manage other connected devices. Manage analytic functions, device connections and integrations at the edge all from the same interface used to manage devices connected to the cloud.